Q: Currently my account is set up as credit card payment. How do I qualify for terms? Q: What are my options for getting a virtual of your product with my customer's art? A: Email your virtual request to creativeservices@signzoneinc.com and they will work with you on your request. Charges may apply. Q: What is an inexpensive way for me to grow my business in your product categories? A: Sign up for our FREE distributor website! Once you are set up, you can customize the header art with your company information. Our top categories are listed and your customer can browse for what they might need. 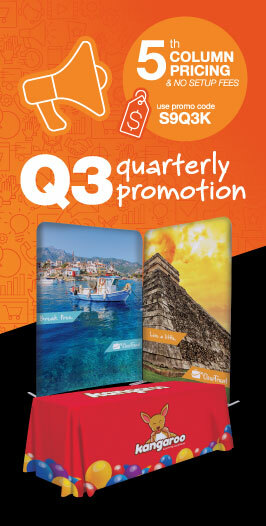 Q: I want to send an e-blast out to my customers on your quarterly promotion. Is there a way to do that? A: Yes. We offer branded and non-branded flyers that you can download and e-blast to your customers. Q: My customer needs a random sample of a product, how do we go about getting them one? A: We do offer random samples, however we feel it is best that you take advantage of our PSA (Personal Sales Aid) promotion. Let’s say it is a retractor sample that is needed. All you would do is set up the art with your logo on it for the item # being ordered and send it in with your PO. You will get the retractor at 4th column pricing on a C. Then subtract an additional 40%. Plus the set-up is waived! Now you have a sample on hand at all times to promote your product and ours at the same time!